While at Autodesk University last week I had the opportunity to sit down with Dave Graveline, host of the popular technology radio show “Into Tomorrow.” His 3-hour radio program airs on over 100 AM & FM radio stations around the U.S., on SIRIUS XM Satellite Radio, radio stations in Germany, Bermuda, New Zealand, Canada and several other sources including Mobile Broadcast Network, BeOS Radio, Sprint Radio, TiVo, CelleCast and many others – every weekend. 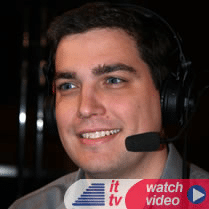 As you may have guessed, this weeks show features his interviews from Autodesk University 2009. So it’s no secret that Autodesk University offers a class on nearly every conceivable topic related to Autodesk products. Of course with such an expansive catalog comes the problem I’ve had every year I have attended AU. That problem? Simple, trying to pick only 1 class per time bracket. During the conference there’s simply more great classes being offered than there is time for those great classes. Autodesk University, It’s that one time of year you can talk about CAD for an entire week, and not be considered a complete dork (partial dork is still an option)! 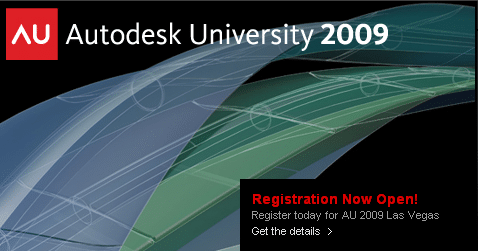 Today marks the commencement of general registration for Autodesk University 2009. If you have plans on attending this year’s conference, you’ll certainly want to get your registration in ASAP. Why the urgency? Discounted Registration: If you register now, you’ll qualify for the discounted “Early-Bird” rate. Hotel Accommodations: The earlier you register, the better your chances of getting a room in the host hotel (Mandalay Bay). Not that the other conference hotels are bad, but as a matter of convenience YOU WANT TO BE IN THE HOST HOTEL! Class Selection: If you can think of it (and it’s related to CAD), there’s probably a class on it at AU! Popular classes fill up fast, so you’ll want to register early to get the best class selection. Just in case you’re looking for some great classes to attend at this year’s conference, I’d love to see you at any of the three classes I’ll be presenting.